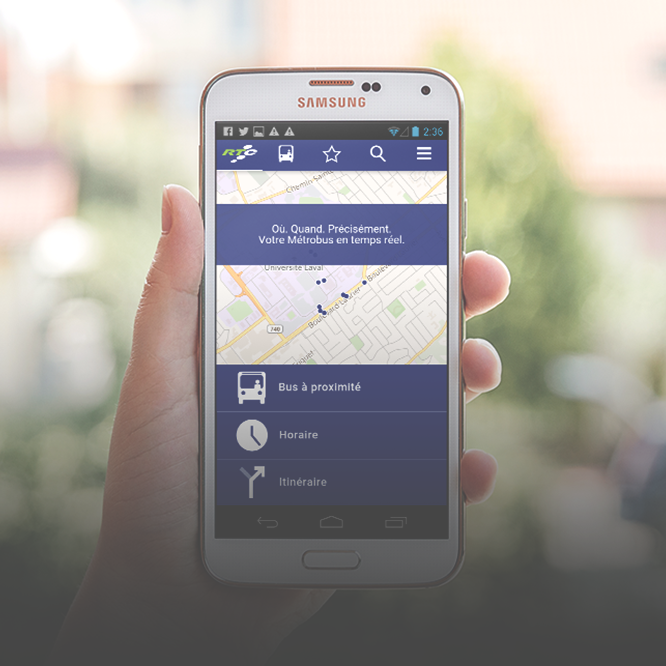 The assignment : Developing a hybrid mobile application – RTC Nomade – which displays, in real time, anticipated times for bus service based on users’ location and route selected. Réseau de transport de la Capital(RTC, Quebec City’s public transit authority) wanted to improve user services by developing a tool to help passengers better plan their bus trips. To meet this objective, Cortex was tasked with developing a hybrid mobile application – RTC Nomade – which displays, in real time, anticipated times for bus service based on users’ location and route selected. Using hybrid app development technology, the RTC Nomade mobile site is also available as an iOS and Android application. In addition to sophisticated user geolocation, the app is connected to the RTC system, enabling it to display, in real-time, bus arrival times at a selected stop. Available both online and offline, and featuring universal accessibility for all types of users, including a personalized alert system, RTC Nomade quickly proved an essential tool for public transit users in Quebec City.